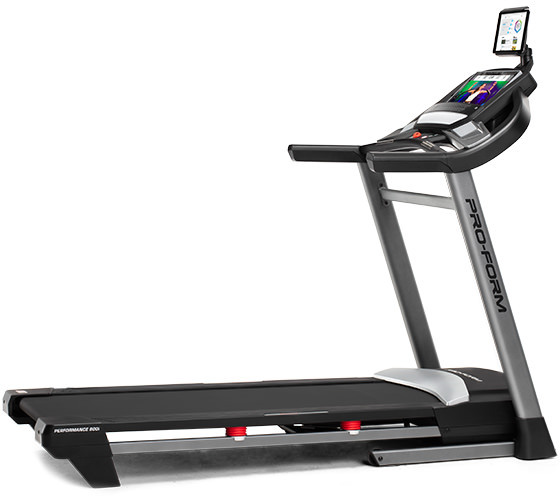 Introduced in late 2018 as a new 2019 treadmill, the ProForm SMART Performance 800i is the top of the line model in the popular series. With brand new features such as a 14" Smart HD touch screen display, the ability to add decline training and a whopping 50 built in workout programs, the 800i is sure to be one of the biggest selling treadmills the company has introduced to date. The ProForm 800i features the company's patented SpaceSaver design, so you can easily fold up the treadmill post workout with EasyLift Assist. The motor is strong and quiet, and the frame is quite durable. There's a lot of excitement surrounding the release of the new ProForm SMART Performance 800i treadmill. And for good reason. For starters, this is the probably the very first entry level treadmill to have both decline capability and a touch screen display, two features typically reserved for the higher end models from ProForm and NordicTrack. Now you have an affordable treadmill with both of these special features. The ProForm 800i allows you to decline to -2% as well as incline up to 10%. This unique experience allows you to target leg muscles that you otherwise would not be able to, as well as increase your cardio training for a more effective workout. You get a nice sized 14" Smart HD touch screen, on which you can control everything with the touch of a button and see all of your workout stats clearly displayed. On the screen you can also access ProForm's iFit Coach, an immersive experience with an endless library of personal trainer designed programs (on top of the 50 workouts built into the machine), plus the ability to run anywhere in the world with Google maps. The coolest part is the fact that the treadmill automatically adjusts its own incline and speed to match whatever you see on the screen. If there's a mountain ahead, the incline increases. If there's a dip, the incline will decrease. This really makes you feel like you are actually outside running in whatever location you choose. On top of the incline/decline, touch screen and all the workouts, you get heart rate monitoring, ProShox advanced cushioning, music system with speakers, a CoolAire fan and a generously sized deck. It's hard to complain about a treadmill that gives you all of these features and capabilities at such a low price, but we can always nitpick right? Although they improved the belt size to 60" long, it's still 18" wide as opposed to 20" on some of the other ProForm treadmills. So it may be a tad narrow for very tall/larger individuals. Not a deal breaker but just something to keep in mind. How Does the Performance 800i Compare to the Other ProForm Treadmills? You have three different series' of treadmills to choose from when it comes to ProForm. There's the Performance Series, the Power Series and the Pro Series. The Performance Series is the most affordable, and the new ProForm 800i now sits at the top of that series. Interestingly, however, the 800i actually has features and capabilities that some of the upper level Power and Pro treadmills don't have. In the Performance Series, you have the 400i, 600i and 800i. The entry level 400i, which was recently upgraded at the same time the 800i was introduced, has a 7" Smart HD touch screen, 50 built in workouts, 2.0 CHP motor, 18" x 50" running deck, up to 10 mph speed and 10% incline. The step-up 600i, which was not upgraded, has an LED screen (no touch), 22 built in workouts, 2.75 CHP motor, 20" x 60" running deck, up to 12 mph speed and 12% incline. 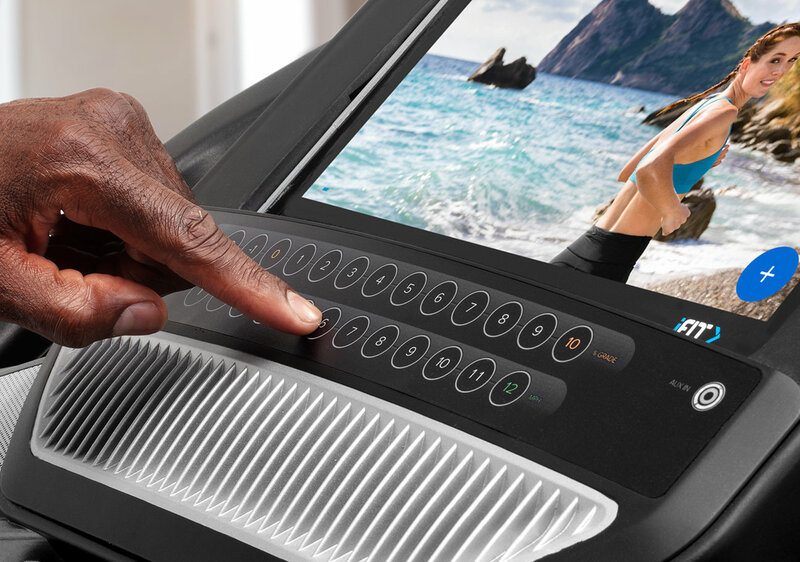 The top of the line Performance 800i, as you've read about above, has a 14" Smart HD touch screen, 50 built in workouts, 2.0 CHP motor, 18" x 60" running deck, up to 12 mph speed and -2 to 12% decline/incline. So the new entry level 400i actually has a more advanced display and more built in workouts than the mid-level 600i. Otherwise the 600i is a step up. The 800i is the most advanced, with decline capability not found on the other Performance treadmills...or Power Series for that matter. The mid-level Power Series consists of the 995i and 1295i. The base Power 995i and the up-level Power 1295i have 3.0-3.5 CHP motors, 15% incline, 30-34 built in workout programs and 325-350 lb. max user weights. These treadmills also come with stronger warranties than the ProForm 400i, 600i and 800i. The top of the line Pro Series has the Pro 2000, 5000 and 9000. All three have touch screen displays as opposed to basic LED and Watts displays on most of the other treadmills in the series. Which ProForm treadmill should you choose? For those on a budget, who don't need the most durable treadmill on the market, we would take a good look at the new ProForm 800i, as it has a good mix of everything you need, plus a nice touch screen, decline capability and 50 built in workouts...more than any other machine we've come across. However, our Treadmill Talk favorite is the Pro 5000, which is the middle range model in the Pro Series. It's one of the best treadmills you'll find in the $1,500 range, and it is built to handle heavier workouts. If you're kind of in the middle, you don't want an entry level machine but can't quite swing the price of the higher end Pro Series, then look at the Power 1295i, which is also a great choice. If you're look for a treadmill that won't break the bank, the new ProForm SMART Performance 800i is definitely a great choice. It has incline, decline, plenty of workouts, iFit Coach, good cushioning, entertainment, a touch screen display and easy folding capability. The only drawback we see is the narrow 18" wide belt, but that should only be an issue with very large individuals who might prefer more width to spread out. Other than that, this one is a real winner. If you want to save a little you can check out the recently redesigned 400i treadmill. Also look at the Power and Pro Series for a little more durability, higher max user weight capacities and stronger warranties. Get the popular ProForm Performance 800i on sale right now!